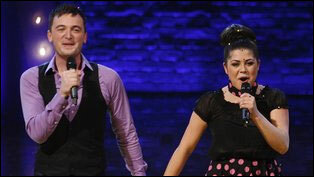 Dubliners Jessica Cervi and Ben Morris were named the winners of 'Fame: The Musical' on RTÉ One on Sunday night. They will now play the roles of Serena and Nick in the nationwide tour of 'Fame: The Musical'. Cervi and Morris contested the final with Sarah O'Connor and Seán Carey and received the most votes from the public. For the final, finalists were invited to sing their favourite song from the live shows. Nineteen-year-old Cervi sang the Etta James classic 'At Last' and also performed a duet of 'You're the One that I Want' from 'Grease' with West End star Noel Sullivan. Twenty-three-year-old Morris chose to perform 'Cry Me a River' and also sang 'Can You Feel the Love Tonight' from 'The Lion King' with West End star Susan McFadden. Speaking after her win, an emotional Cervi said: "I can't believe it. I just want to thank every single person who believed in me." Her co-star Morris thanked everyone who voted for him and supported him every week at the live shows in The Helix. Fellow judge and original 'Fame' TV star Erica Gimpel said: "I'm really happy for you both. You blew us out of the water tonight. I can't wait to see you in the musical."